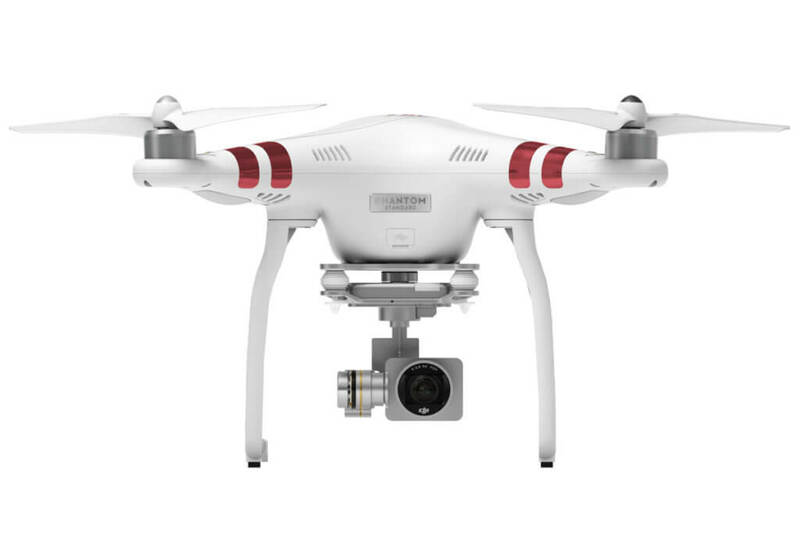 The DJI Phantom 3 Standard was initially released in April 2015 as the next platform in the Phantom line. Building on the hugely successful Phantom 2, the Phantom 3 Standard shook things up a bit. The first Phantom to come standard with an integrated camera, this drone was designed from the start to be a camera drone. Learning from not only the experiences and feedback from the Phantom 2, but also the Inspire 1, DJI approached the Phantom 3 not as an update, but as an entirely re-designed platform, just packed into the same frame. The significant improvement noted in the 3 is the addition of DJI’s Lightbridge downlink capability, which allows the controller a maximum range of 4800 meters (three miles), and the visual positioning system, that allows the Phantom 3 to maintain its position at lower altitudes or indoors where GPS is weak or unavailable. The Phantom 3 is available in five models which are Professional, Advanced, Standard, 4K, and SE. Each model has it’s own distinct characteristics and is designed to work best in certain situations or for different roles. This review, however, is specific to the Standard model. Phantom 3 Standard records in 2.7K. It includes some additional programs and features to help simplify flying, which includes Point of Interest, Follow Me, GPS Waypoints, Course Lock and Home Lock. The Phantom 3 Standard features DJI’s Intelligent Flight Battery. This has smart technology that continuously monitors the remaining power and converts it into flight time remaining, so you know precisely what is left in the battery while you are in the air. It also features intelligent sensors that monitor the battery as it charges to protect from over-charging. The camera on the Phantom 3 Standard is very impressive. It is entirely possible to forget that you are editing pictures taken with a drone when working with the photos in post-production. The camera records in 2.7k at 30fps. For photographs, it has a 1/2.3’’ CMOS 12M pixel camera sensors which provide high-quality and sharp pictures. This camera is fantastic for beginners as it manages to take excellent photos without much extra input from the pilot. As long as you can fly the drone over the subject, you are going to have clear and high contrast photos and video. The camera can shoot is both Adobe DNG raw and JPEG formats. You can also use the “Go” app to manually change your setting such as exposure compensation, shutter speed, and ISO on the fly. You can also select between each of the shooting modes as well without having to land. There are a few drawbacks to the camera on the DJI Phantom 3. The sensory is relatively small, which means it will struggle more with changes in lighting when compared to its larger cousins, which can create some detail was. Another common complaint is what is known as “rolling shutter artifact,” which is horizontal banding that can occur when taking photos while flying. However, as long as you go in knowing these things, they are easy enough to work around. Another downside to the camera system is that you can not remove the camera, and therefore cannot upgrade to a high-grade camera. When you are ready to move to a more advanced camera system, you will have to purchase a new platform. Since DJI has rolled out several new versions of the Phantom 3, as well as the Phantom 4, the price of the Phantom 3 Standard has fallen drastically. At the time of this writing, the Standard is listed on Amazon for $579.00. For a beginner that is looking to take a serious step into the world on drones, the Standard offers the most significant value for the money currently on the market. Even if a person had more to spend, I would still recommend the Phantom 3 Standard and suggest purchasing extra batteries and the like. After looking at the Phantom 3 and comparing it to the previous models, it is obvious that the DJI has stepped forward with a true professional-grade camera drone. With all of the exciting features that we have seen so far, we can only expect great things from both the series and DJI themselves. DJI Smart Controller Review: Is It a Necessity? LUMOID is an online magazine that lives at the intersection of the art of photography and the technology that powers it. Our unbiased reviews, industry news, and opinion pieces are designed to inform and inspire the next generation of great photographers.